This classic combination won’t disappoint! This is the true breakfast of champions. Spread the bacon evenly on a baking tray and grill at 180˚C, turning once, until golden brown. Bring the water and vinegar to the boil in a pot and stir to create a whirlpool. One by one, crack the eggs into a cup and gently pour into the swirling water. Lower the heat and poach until the egg whites are cooked (± 2 minutes). Lift the eggs out with a slotted spoon or spatula. 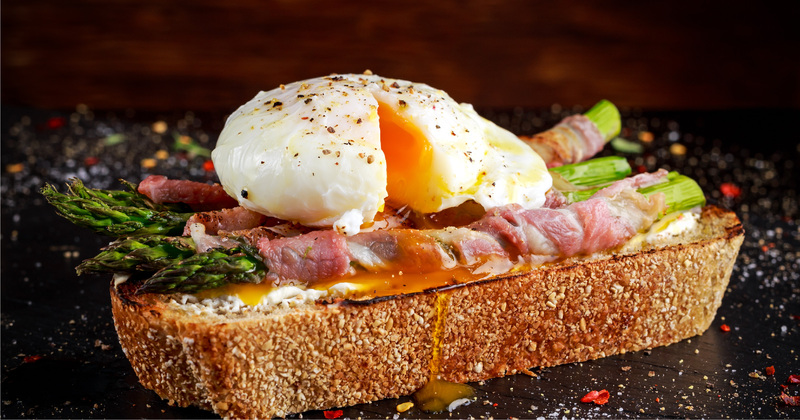 Place the grilled bacon on the toasted bread and top with the poached eggs and pecorino shavings. Garnish with rocket leaves and serve hot.